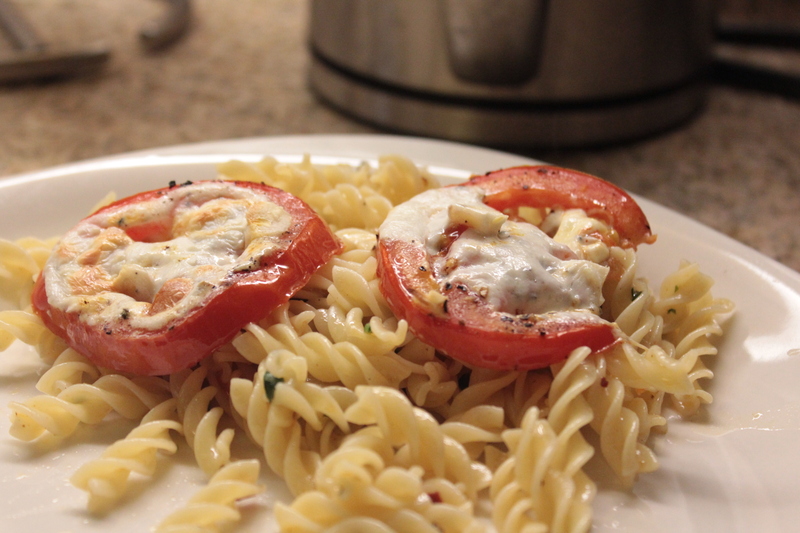 This pasta dish is a lot lighter than pasta that’s drenched in sauce, and has great flavor from the broiled mozzarella and tomatoes, fresh basil and roasted garlic. Heat broiler. Cook pasta according to package directions; drain and return to pot. Meanwhile, arrange the tomato slices in a single layer on a lightly oiled rimmed baking sheet. Season with 1/4 teaspoon each salt and black pepper. Dividing evenly, sprinkle the slices with the mozzarella. Broil until the cheese is bubbly and golden. In a small saucepan, toast the garlic over medium heat until fragrant, 1-2 minutes. Combine the red pepper oil, basil, 1/2 teaspoon salt, and 1/4 teaspoon black pepper in a small bowl. Add to the pasta and toss to combine. Serve topped with the tomatoes, and additional basil.